Showtime has released key art for its new scripted Dice TV series. Check it out, above. 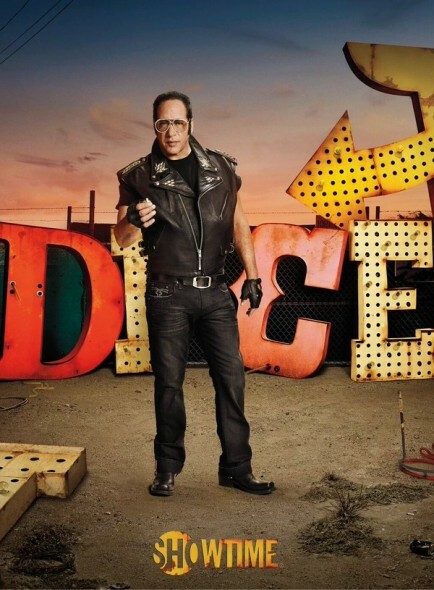 Consisting of six half-hour episodes, the first season of Dice features the life of comedian, actor, and writer, Andrew Dice Clay. The cast of Dice includes Clay, starring as himself. Also featured are Kevin Corrigan, with guest stars Natasha Leggero, Lorraine Bracco, Adrien Brody, Michael Rapaport, Wayne Newton, Criss Angel, and Rita Rudner. The single-camera comedy premieres this spring. LOS ANGELES – January 12, 2016 – Today, SHOWTIME debuted the key art for its new scripted, semi-autobiographical series DICE. The six episode series will follow the life of renowned comedian, Andrew Dice Clay. DICE also stars Kevin Corrigan with guest stars Natasha Leggero, Lorraine Bracco, Adrien Brody, Michael Rapaport, Wayne Newton, Criss Angel and Rita Rudner. From Fox21 Television Studios, the half-hour comedy will premiere this spring on SHOWTIME. Created by Scot Armstrong (Old School, The Hangover Part II), DICE chronicles the “semi-true” stories of Andrew Dice Clay, whose unique brand of humor often gets him in trouble. Once on top, the comedian now must work to resurrect his career, pay his gambling debts, manage his sons’ rock band, fend off old fans and keep his family afloat. The series executive producers are Sean Furst, Bryan Furst, Bruce Rubenstein, Andrew Dice Clay, Scot Armstrong, Brian Gatewood and Alessandro Tanaka. Clay also has a role on the upcoming Vinyl TV series, on HBO. Reportedly, he will play coked-out radio station mogul, Frank “Buck” Rogers. Are you an Andrew Dice Clay fan? Do you like the sound of the Dice TV show? When it debuts on Showtime, do you plan to check it out? Tell us. More about: Dice, Dice: canceled or renewed?, Showtime TV shows: canceled or renewed?, Vinyl, Vinyl: canceled or renewed?